Reverse Page is a browser add-on aimed at enhancing your browsing behavior; however, in practice this product shows quite the opposite. The Reverse Page program displays third-party advertisements, including coupons, web banners, interstitial advertisement, in-line ads, and many others. These advertisements are shown on virtually every website you access, but you should avoid interacting with them because some of them may take you to unreliable websites. 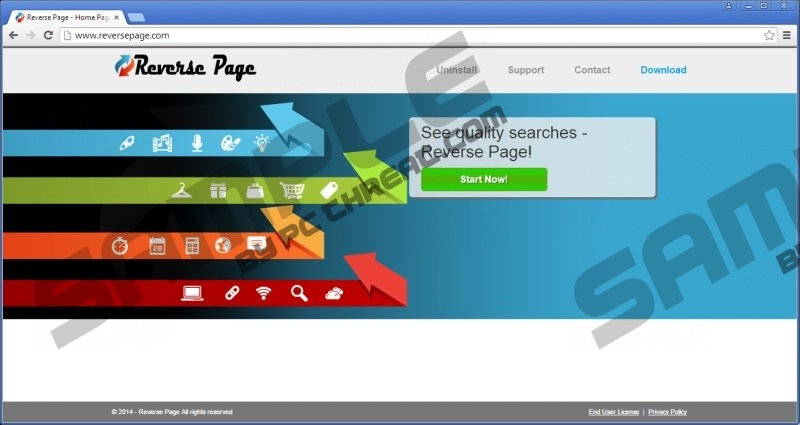 Reverse Page is developed by SuperWeb LLC, which is notorious for many identical advertising-supported browser add-ons, and the developers of the program do not endorse the websites advertised. Hence, the program falls into the category of adware. If you want to browse the Internet as usual, you should remove Reverse Page and reconsider your browsing patterns. The Reverse Page program is promoted at reversepage.com, but the odds are that you have installed this program by mistake. This is because it is distributed alongside other free programs, and a lot of computer users tend to disregard the information they are provided by the installation wizard. Reverse Page is not an infection, but your interaction with Reverse Page ads may have some effect on your privacy, which is why it is so important that you remove Reverse Page from your computer. The pop-ups displayed by the Reverse Page browser add-on may invite you to take part in a survey, play online games, download software program, or try out some other services and products. It is advisable to ignore online contests and invitations to install software programs, such as scanners and updates, because they may turn out to be malware. Another reason why you should not wait but remove Reverse Page from your computer is the fact that the program is capable of monitoring you, which is a typical feature of the majority of advertising-supported browser add-ons. Once installed, Reverse Page starts collecting information about your browsing behavior so that the data collected can be used for the improvement of the service. The creators of Reverse Page are interested in your clicks, impressions, search terms, settings, browsing history, and some other details. In some cases, personally identifiable information, such as email address or name, may also be recorded. If you want to put an end to Reverse Page, remove it from your computer right now. Below you will find our removal guide, but we recommend that you implement SpyHunter, which easily eliminates Reverse Page from your computer. After installing this real-time protection program, you will not have to worry about your online security and malware removal, so take action right now. Open the Start menu by clicking the button in the lower-left corner. Uninstall the Reverse Page program. If you want to be sure that you have entirely removed Reverse Page, you should install a powerful scanner. Quick & tested solution for Reverse Page removal.